DeMolay is an organization dedicated to preparing young men to lead successful, happy, and productive lives. Basing its approach on timeless principles and practical, hands-on experience, DeMolay opens doors for young men aged 12 to 21 by developing the civic awareness, personal responsibility and leadership skills so vitally needed in society today. The 2016 Annual Communications speech from our Southern California DeMolay Master Counselor. Recorded at California Grand Lodge,on Sunday October 30th. Congratulations to the members of Conejo Valley DeMolay for their recognition at Grand Lodge Annual Communication 2016 – we are so proud of you all! Conejo Valley DeMolay hosts a private showing of Rogue One: A Star Wars Story, before the the world premiere. Conejo Valley DeMolay is continually grateful for the opportunity to host special and fun fundraisers that help our chapter to grown and help our communities. Interested in attending? 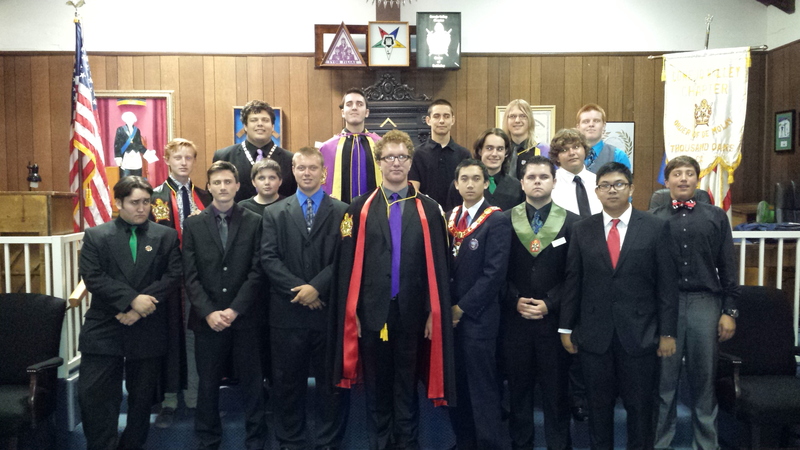 Contact a DeMolay from Conejo Valley! Being in DeMolay gives young men the opportunity to lead events with the help of experienced advisors and support from it’s Masonic Sponsors from across California. The Officers of Conejo Valley DeMolay were installed on January 16th, 2016 at 7PM at Conejo Valley Lodge, in Thousand Oaks California. The Officers for 2016: Master Councilor: Gabriel Ibarra Senior Councilor: Josyph Fletcher Junior Councilor: Christopher Hamilton Senior Deacon: Tony Ibarra Junior Deacon: Christopher Vadbunker Chaplin: Christian Cule Senior Steward: Sterling Rosenfeldt Junior Steward: Anthony Gambino Marshall: Armondo Magana Sentinel: Ryan Gooch Standard Bearer: Micheal Langberg Thank you to everyone who came and supported our Installation and made it special! Conejo Valley DeMolay hosts a private showing of Star Wars: Episode VII The Force Awakens, before the the world premiere. Conejo Valley DeMolay has been blessed with the opportunity to host unique and fun fundraisers that help our chapter to continue on. Being in DeMolay gives young men the opportunity to lead events with the help of experienced advisors and support from it’s Masonic Sponsor. Join the conversation on Facebook. Stay up to date with the latest news and events - get social with DeMolay! DeMolay has seven Cardinal Virtues, which constitute the basic ideals and essential teachings of the organization. DeMolay is an organization dedicated to preparing young men to lead successful, happy, and productive lives. allegiance to Frank S. Land, the founder of DeMolay International.